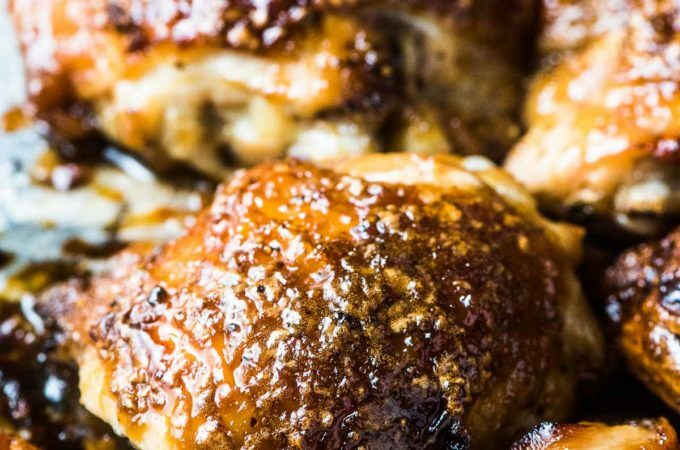 This is the most amazing Baked Honey Garlic Chicken Recipe made with a 5-ingredient deliciously sticky sauce. It's guaranteed to be a hit at your dinner table! I tend to think of chicken like this: its sole purpose is to act as a vehicle to help get more of whatever delicious sauce it's coated in into my mouth. Are you the same? After you make this recipe you'll want to lick your fingers, the plate, and the pan these were cooked on. This honey garlic chicken is that good. 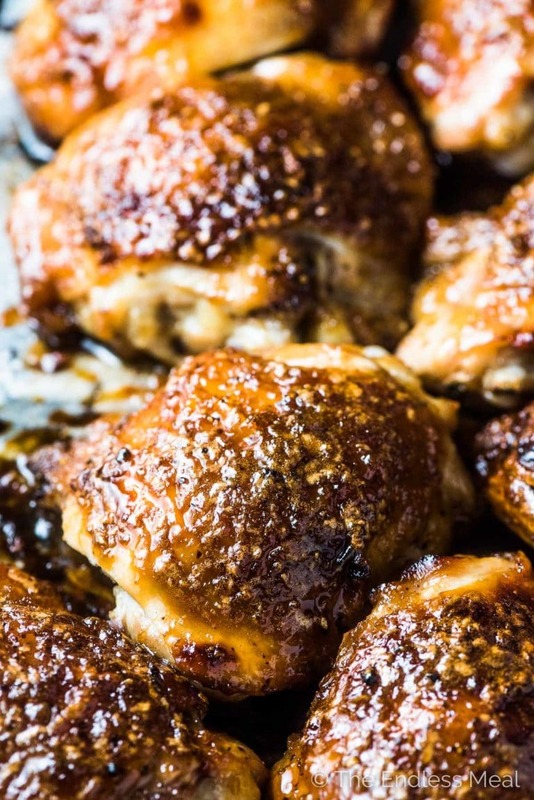 It also comes together in only 35 minutes, and most of that time is spent staring at your oven willing this mouthwatering honey garlic chicken to hurry up and cook faster. So easy. So good. 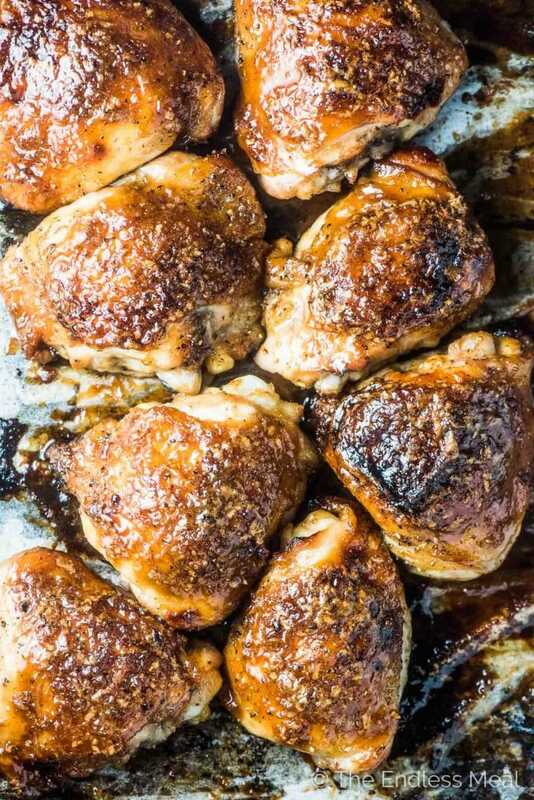 The sweet garlicky sauce coats every bit of the chicken so every bite is too good for words. The ‘secret' trick I have of grating the garlic and onion means that they dissolve into the sauce and make the sauce 100x better. Sticky sticky sticky … as honey garlic chicken should be. 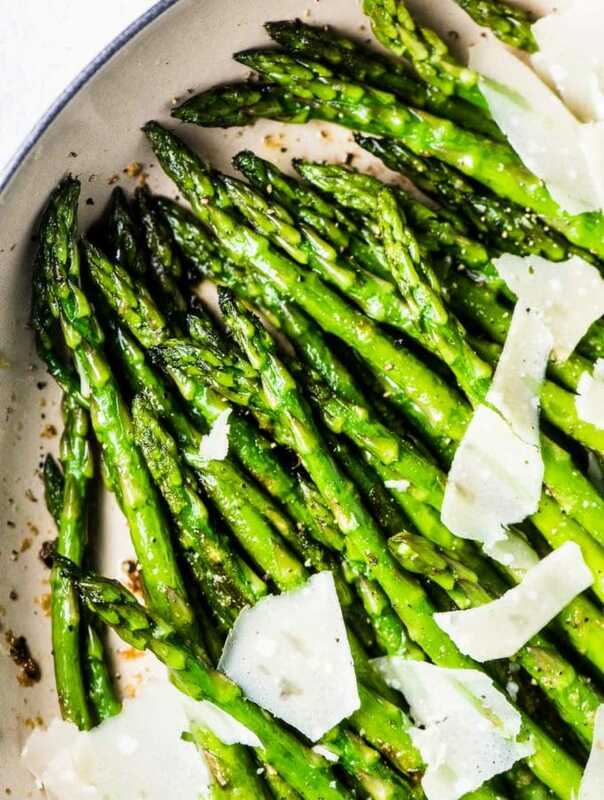 This is one of those healthy recipes (paleo and gluten-free!) that doesn't seem like it should be. It tastes too delicious to be good for us. 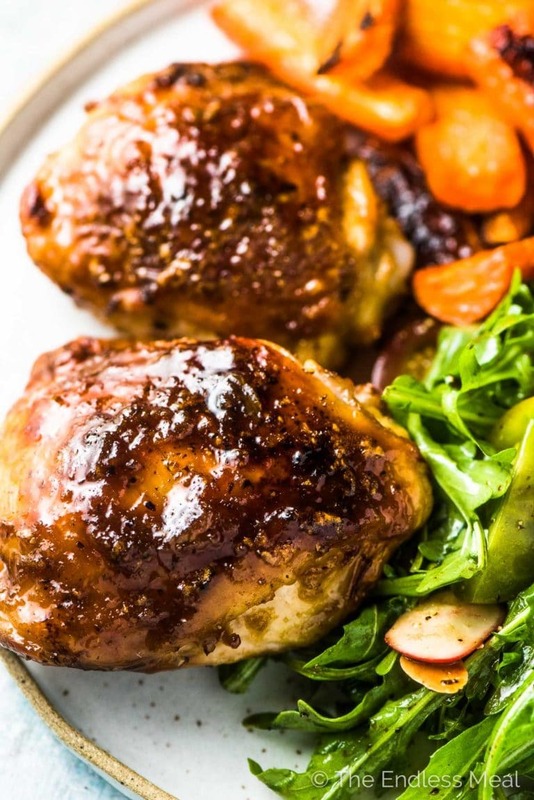 This baked honey garlic chicken is SO EASY to make. Start by roasting the chicken until it is almost cooked through – about 30 -35 mins. Then make the sauce. Pop the 5 honey garlic sauce ingredients into a small frying pan and bring it to a boil for a couple of minutes. This thickens the sauce so it sticks to the chicken. Trust me that this little extra step is 100% worth it. Dip the chicken in the sauce and broil the bottom side. Then flip the chicken over and baste the rest of the sauce on top before you broil it for a few more minutes. Broiling the chicken at the end will caramelize the sugars in the honey to make it extra delicious. I like to load up on the veggies when serving this chicken. Often it's as simple as a big green salad and some roasted carrots or broccoli. Rice (or cauliflower rice, if you're weird like me) is great with any leftover honey garlic sauce drizzled over the top. 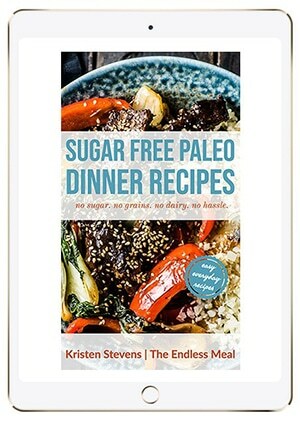 Remember to subscribe to THE ENDLESS MEAL’S NEWSLETTER for FREE to get healthy and delicious recipes each week + our cookbook! 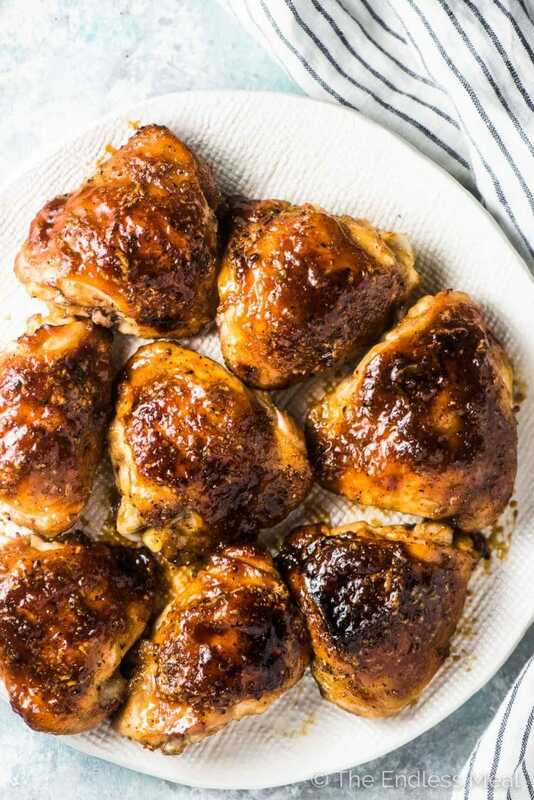 This Honey Garlic Chicken recipe is easy to make and so delicious that you'll be spending the entire baking time staring at the oven in anticipation. Preheat your oven to 420 degrees. Place one oven rack in the middle and another rack at the top. 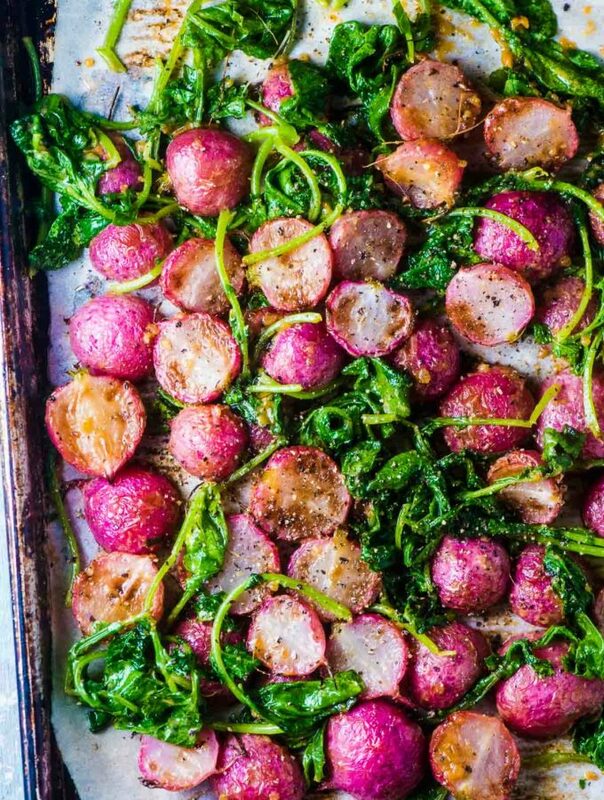 For easy cleanup, line a baking sheet with aluminum foil or parchment paper. While the chicken is cooking, bring the honey garlic sauce ingredients to a boil for 2 minutes in a small frying pan to thicken the sauce. Remove the chicken from the oven and carefully drain any liquid from the pan. Dip each chicken piece in the sauce and put the chicken back on the pan skin side down. Broil (on the top oven rack) for 5 minutes. Turn the chicken over and baste the skin with the remaining sauce then broil for 5 minutes more. If your oven broils at higher than 500 degrees, watch the chicken VERY closely so the sugars in the sauce don't burn. Chicken is fully cooked when it's 165 degrees Fahrenheit (use a meat thermometer to test this) and the juices run clear. This recipe is THE BEST! I’m never making hg chicken any other way. Thank you!!! I’m happy you think so, too! How would you adjust the time, etc., for chicken drunsticks? Bone in thighs and drumsticks cook at about the same time so the 25 mins total cooking time should do. If you have a meat thermometer, you can check to make sure the chicken is at least 165 degrees. If they’re big drumsticks you can leave them in for an extra 5 minutes or so. It was very good. But for a diabetic , I do not know .I will soon tell. The only thing to say is have everything done ahead of time. And keep a wet cloth handy. It is a good recipe can be sticky. I hope dinner didn’t throw your sugars all out of wack. I’m happy to hear you liked the recipe! I made this tonight. It was very yummy. Two things I’ll do different next time.. First, I’ll precook for 25 minutes. I found the chicken was ‘just’ a bit underdone after the 2nd broil. I put it in the oven at 425 for 5 minutes more. Also, I will take a fork after the precook and pierce the chicken to let the yummy sauce go deeper into the chicken. The recipe is a keeper! Thanks! I’m so happy you checked it before digging in! Sometimes exact times can be hard to give as the size of chicken breasts or thighs can vary quite a bit. Good idea to poke the chicken to let in the sauce! 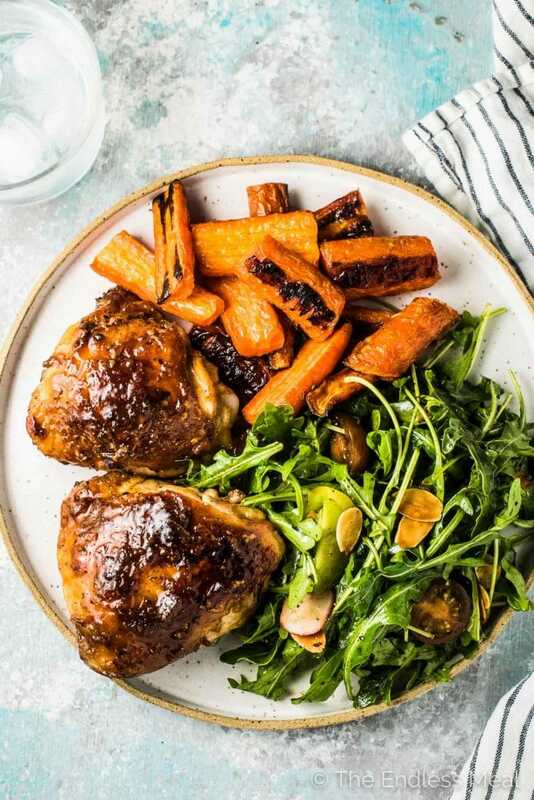 Made this for dinner tonight using skin-on thighs and drumsticks and it was absolutely delicious! Excited to try with boneless, skinless chicken breaks next as I’m sure they will be delicious as well, albeit a bit healthier. Great, quick, and tasty meal for any night of the week. Thanks for an awesome recipe! This has become one of my favorite recipes! My kids and husband love it, and it’s actually pretty easy to do. The flavor is perfect exactly as the recipe is written, but I might experiment with adding or altering the flavor components just for fun. Does it matter if i use table salt vs. sea salt?? This is amazing!!! I make this when I want to bribe hubby to do something 🙂 haha!!! Thank you for all you work you recipes are mouth watering and your photos are amazing….great work!!! Oh man! I can’t wait to try this. It sounds so easy and looks amazing! Thanks for sharing. Can this be done in the slow cooker do you think until the broil part? The broiler on my oven is tiny and useless, can you just cook the chicken in the oven with the temperature turned up after adding the sauce? I definitely think that would work. It is really just to get the sauce to ‘stick’ to the chicken a little more. Enjoy! This was awesome! Thank you so much! Wow, made this for dinner tonight, and it was absolutely amazing. This chicken was so delicious. I will be making it again for sure! Wow — these were soooooo good! Thanks for the recipe; the whole family enjoyed it. Honey garlic chicken is my weakness. I love that you add molasses in the recipe, sounds very tasty! Wow, that skin is gorgeous! I love the ingredient combination and can’t wait to try this! I can’t wait to try this recipe. Here’s my question: Can I cook the chicken with the skin to add flavor, but not eat the skin and decrease the fat? Does cooking with the skin on add fat to the chicken meat per se? I would choose to do it one way or the other. The extra flavour from the skin comes from eating it directly and from the fat you add to the honey garlic sauce, not from soaking into the chicken.